Hunter Friedland knew he wanted to combine his interest in technology with his career in the hospitality industry, he even knew he wanted to be an entrepreneur, he just didn’t expect all of it to happen before he even graduated college. Friedland is the creator of the app Rewardzzz, which he is soon to soft launch here in the Ithaca and Tompkins County area first. Rewardzzz is a universal rewards program for independent businesses. It’s kind of like having one of those punch cards, but for multiple businesses. You are already earning rewards at multiple businesses around town, the app just gives you one place to collect them and redeem them at any of the businesses in the Rewardzzz ecosystem. The idea started with hotels. That’s why there are three z’s in the name, it was going to be an app to collect rewards for sleeping at independent hotels. But it quickly expanded into food and beverage businesses as well. Friedland transferred to Cornell University two years ago. A friend introduced him to the world of cryptocurrency and block-chaining and he knew he wanted to do something with the technology. At the same time, in his Hotel Operations class, there was a discussion of the pros and cons of running an independent hotel. He began calling around to local independent hotels to learn more about how they created loyalty and increased exposure to their business and if they had an interest in creating a loyalty program. What he found was that these independent hotels were already creating relationships with other local businesses like coffee shops, bars, and spas, etc. Now, the app looks to cover all of those businesses to create a diverse local economy ecosystem rewards program. 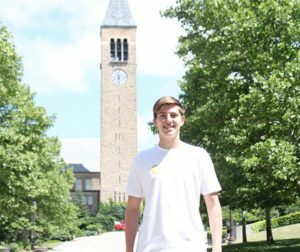 After developing his business plan last summer, when Friedland came back to campus he applied and was accepted to eLab, a competitive, year-long incubator program that helps students evolve their business to the point of launch. Through the eLab course, Friedland found two problems that the independent business industry faces: value and convenience.